Mad luv for this top. I saw it in Primark a good couple of weeks back. It was 'I. NEED. YOU.' at first sight. 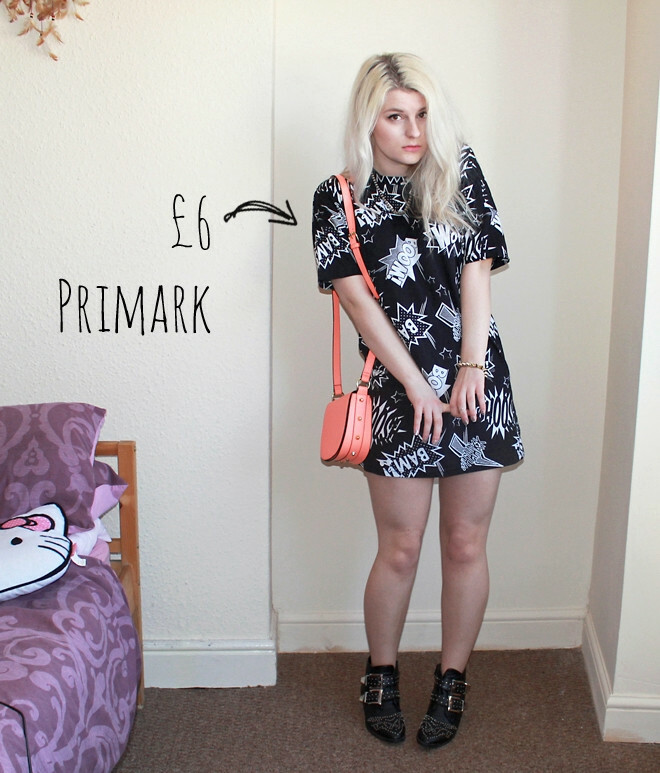 The slouchy fit, the print, the £6 price tag - it was just spot on, bargain-alicious. Somehow, I didn't buy it that day though, I thought I'd give myself a little bit of time to mull it over - uh huh, a super risky decision when it comes to Primark as things come and go in that place like.. well, let's not go there. But it was fate - when I nipped into the store the other day it was still there. I had to size down twice as it's literally mahoosive fitting, but I like that it's wearable as a top or a dress. As for the H&M bag, again, fate led me to this little bay-bay (well, I like to tell myself that...). 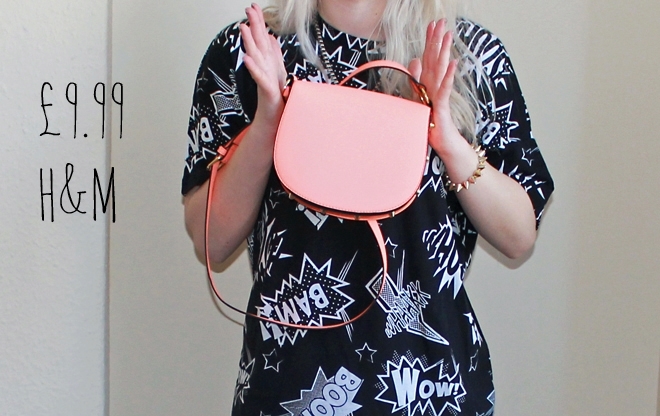 H&M had put on quite the spread of these bags in a selection of white, black and neon orange. As tempted as I was to go for the white version, I wear enough monochrome as it is, so I thought the traffic cone-ish shade of the orange would be a better choice. I have literally no small bags so for £9.99 this had to be mine! The colour hasn't photographed too well (darn neon!) but it's really, really bright! Well, tonight I'm off to see a midnight viewing of Iron Man 3 at the IMAX. Kind of ties in with the outfit eh! I wish it was acceptable to take a sleeping bag, but alas, I must appear normal and not embarrass my boyfriend. Copious amounts of caffeine will be consumed so that I can stay awake until 12 and then for the whole film (party animal here). 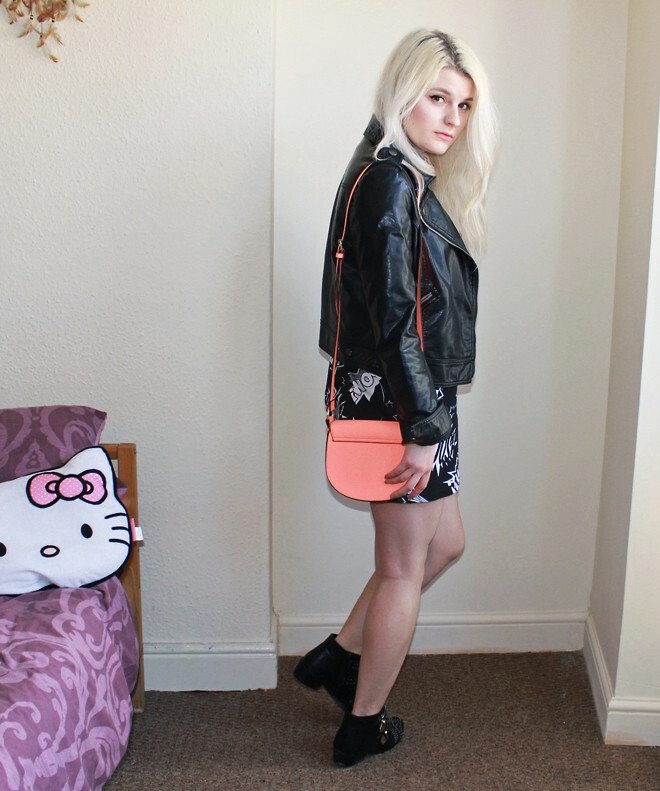 Don't forget, you can vote for me to be Best Thrifty Blogger of 2013 in Company's Style Blogger Awards here! I'm in category 9 - after clicking robynmayday.com just head to the final page and click 'submit'! I can't believe that top is only 6 quid, what a bargain! So cute. Love the sunnies too, hopefully the sunshine stays so you can get good use out of them :D enjoy Iron Man 3! I've been keeping my eye out for this tee - I love it! Great outfit! love the bad and dress. Stunning! That bag is such a perfect color! Oooohh I love that t-shirt/dress - especially for 6 quid! Gonna have to take a trip into Primark this weekend to see if there's any left! £6! that is an amazing t-shirt for an amazing price! I'm off to Primark! Love it! Looks amazing as a dress hun! Such a funky dress - and as ever - BARGAIN! You are the queen of this! Have voted for you in the Company Style Blog Awards! I fancy you. I love that dress. And we are BAG TWINS NOW TOO. Zomfg!